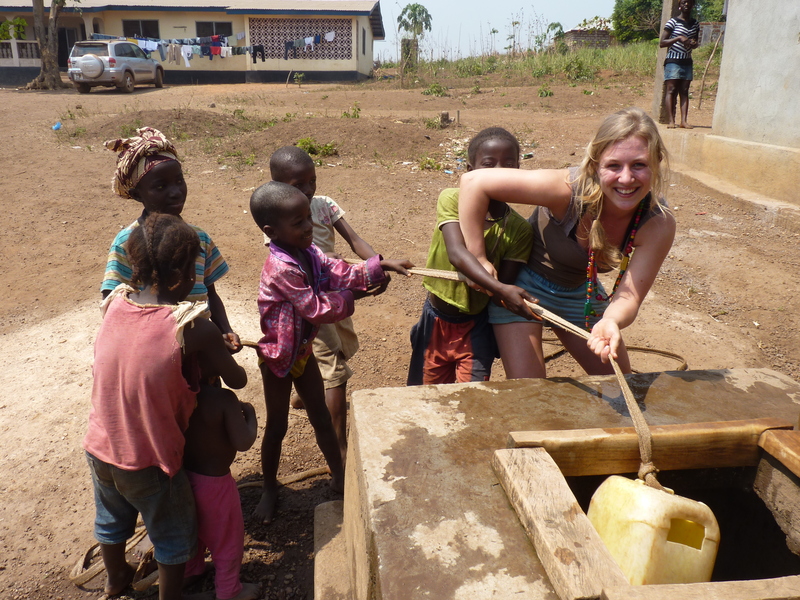 Collecting water is easy when you have a band of very willing little helpers! We are now a far cry from air conditioning, electricity, shops selling more than the essentials and of course cold water. We have 4 rooms between us and after multiple trips to the well are all set with everything we need! Cockroach and lizard pets included. 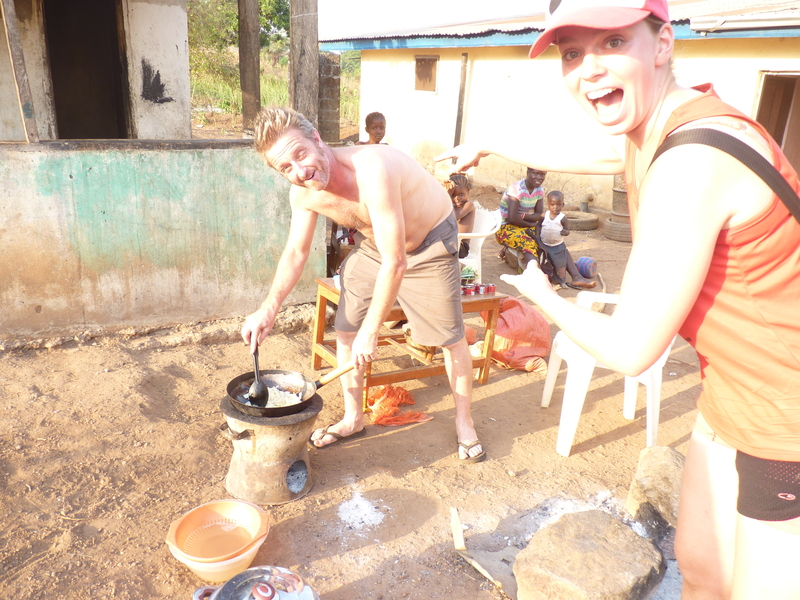 Our host family cooked for us the night we arrived…rice, cassava leaves and groundnut soup and although delicious it did blow our heads off! For the rest of the week Peachi is mother hen to us chicks, making sure we are fed and watered. He nearly blew his hands off trying to light the outdoor stove with kerosene until Mumma Jebe stopped laughing long enough to help him out…it’s all going very well! Oh my goodness me, it’s a white man cooking!! The orphanage funded by Australian charity Orphfund is a short and wonderful walk away through palm trees, villages and lush greenery just past the local secondary school. 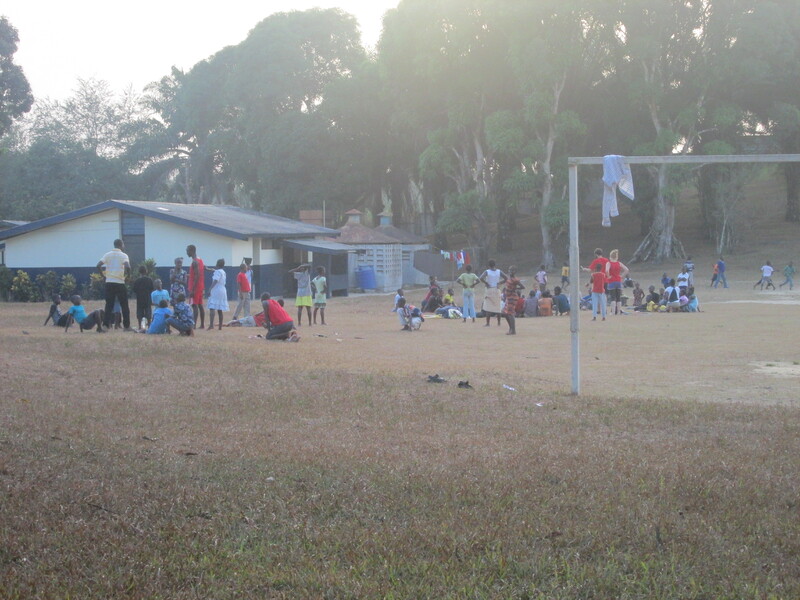 The orphanage shares a sight with the primary school and there are 30 children living there. I was shocked to see their rooms after expecting a similarity to SOS Makeni. Here they are lucky if they have a mattress, even then they are thin and mouldy. It is more run down and dirty and the rooms have small piles of clothes dotted around the edges. They seem cramped but nonetheless extremely happy and grateful for what they do have. 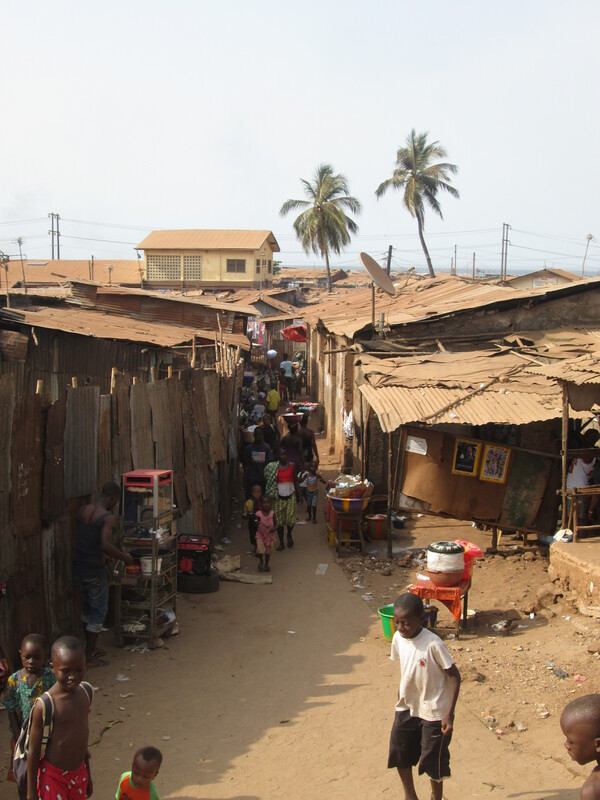 With so few belongings they take HUGE pride in going to school and their uniform, perhaps aided by the knowledge they’ll get a flogging if they are late or untidy. As we have found throughout our tour the Mothers and Aunties are big hearted and extremely kind, they have jolly personalities and are highly respected by the children. We had a wonderful welcome with singing and dancing, a great start to a wonderful week. This week our focus has been different to before. Our aim is to create a show for the children to perform in followed by our acts then a fire finale. The orphans have been like sponges, soaking up everything we have taught them and they really have been a pleasure to teach. We have a booty shaking Beyonce number that ALWAYS ends with a dance off, 2 action packed cultural dances and enough circus skills to tour the world! As we have been able to teach every child once a day their skills have rocketed. 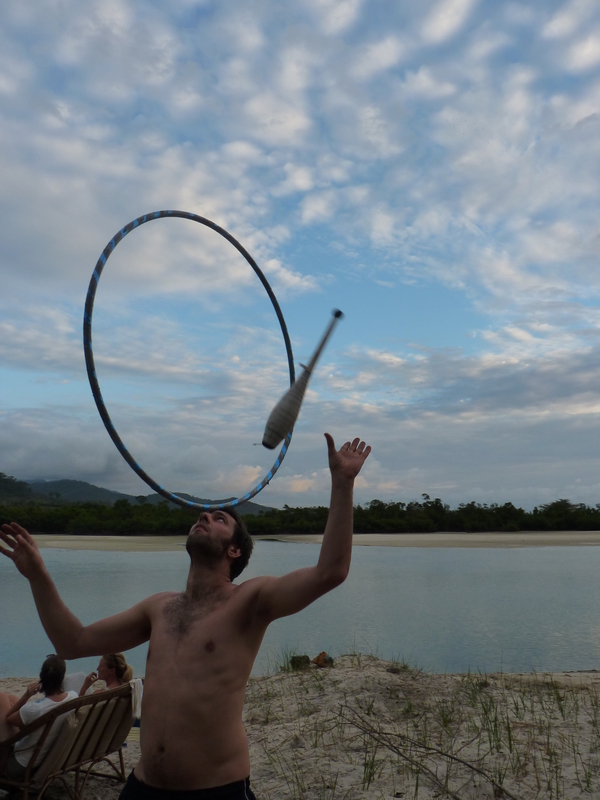 There is a very talented bunch of hoopers, the diabolo spinners have mastered over the leg throws and the trampoline trick and one boy who had never juggled before is now mastering 4 balls! Now if that isn’t a success I don’t know what is. Thursday was a real treat. We performed for the secondary school in their morning assembly to advertise the show and were met with big whoops and cheers! We were no longer the strange white people walking past their school every day and instead the travelling circus coming to town! 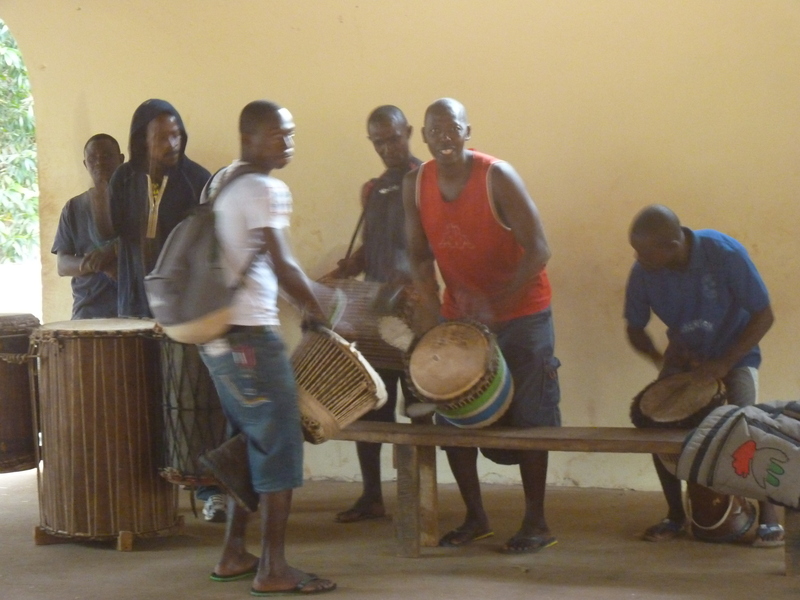 We had a following of drumming children, it was great! After a successful teaching day we marched into town with music blaring, flyers to hand out, circus toys and an ever growing entourage of excited children. (Later, after explaining the story to Brima and Morlai we all agreed we were like the Pied Piper of Hamlet!) 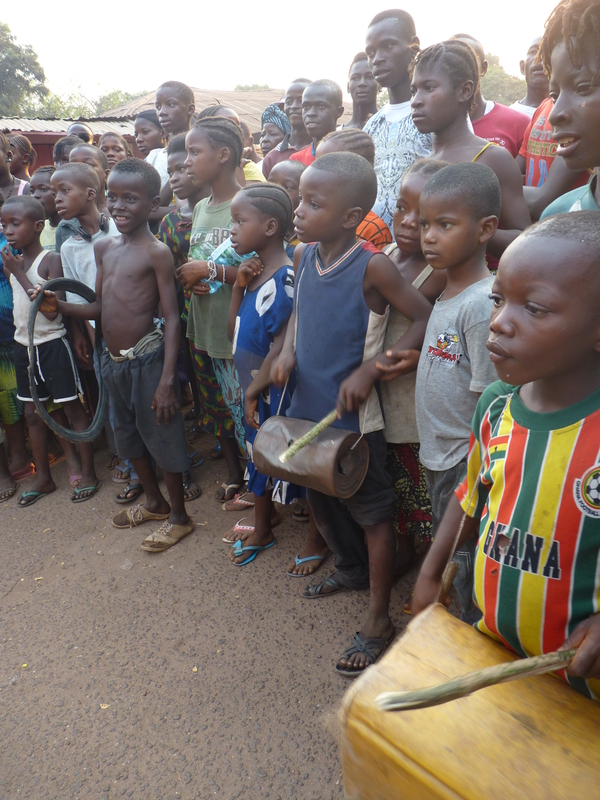 We paraded through the town announcing the show and doing impromptu flash mobs…we even did a mini show for the Paramount Chief of Kamakwei and his family. Such a lovely moment to see 100 plus children making a huge circle outside his front door and their grinning faces as we juggled, hooped and danced. The Chief was amazed by the whole affair, he was so lovely and welcoming and promised to be our guest of honour on Saturday. It was a surreal moment but we all left upbeat, energised and very, very happy. Tim juggling in the parade. 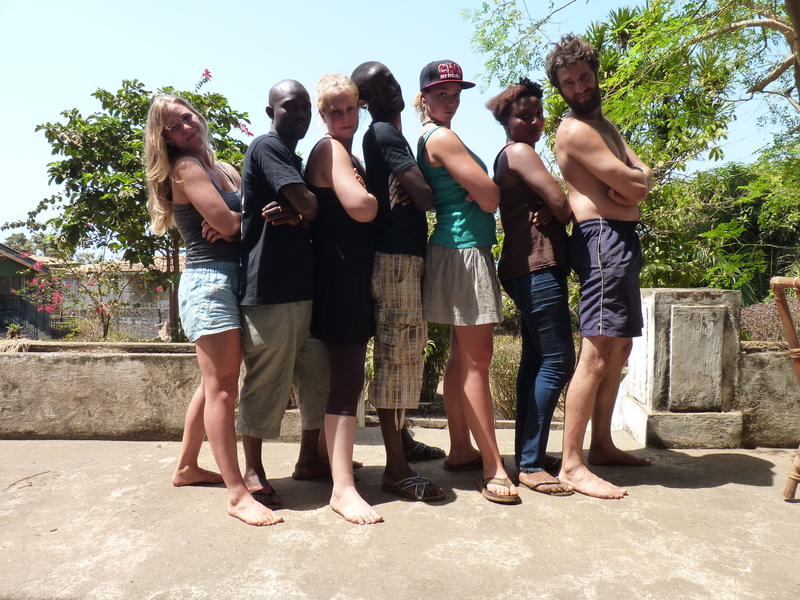 Tim, Livi, Emma, me and Brima with the Paramount Chief of Kamakwei! Friday came round surprisingly quickly and we spend the day polishing off the routines and finalising running orders with the children. We had a well-earned night out at a very surreal Beauty Pageant in the town hall to celebrate Valentine’s Day, which is unexpectedly a huge deal amongst the youth of Kamakwei. We played how many Africans does it take to change a light bulb and enjoyed the guy selling eggs at the disco. Three hours later we had seen the dimly lit silhouette of 2 contestants and decided to call it a night. The show on Saturday was AMAZING! 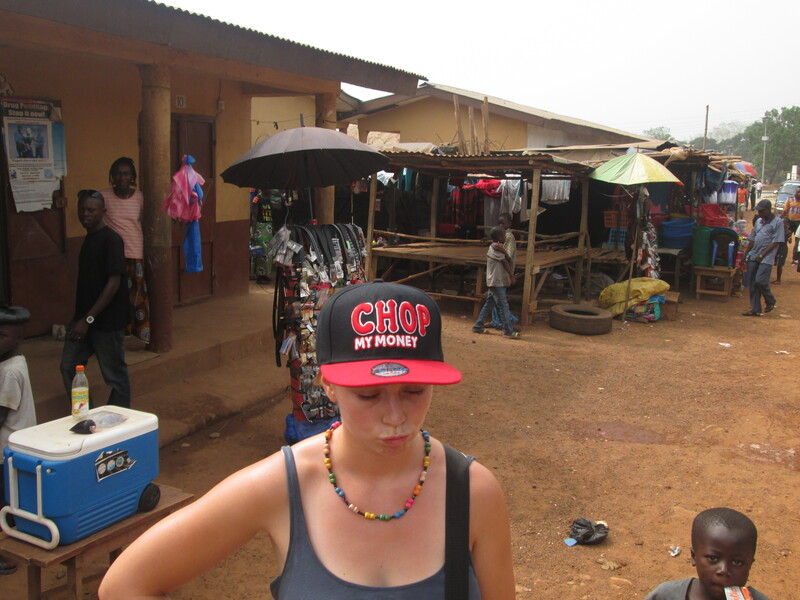 We turned up at the orphanage (after me and Emma had spent the morning getting African braids and new visors!) 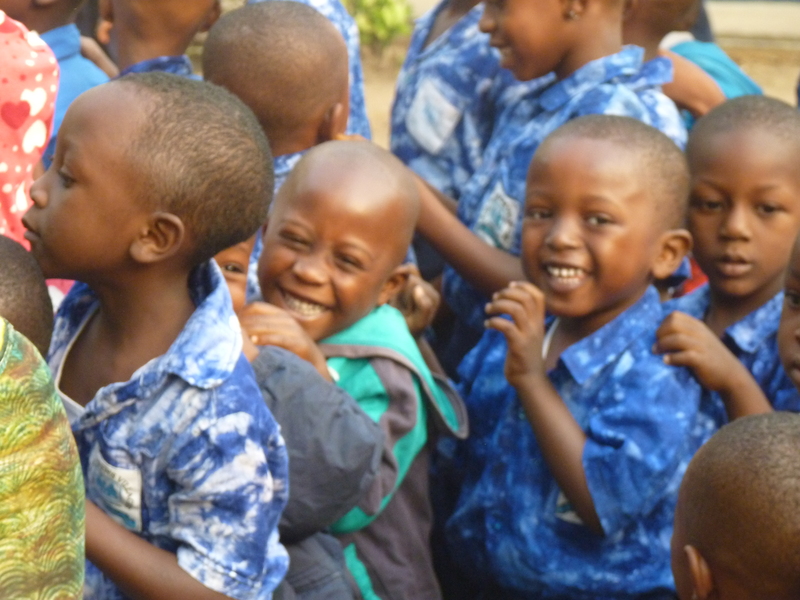 to see all of the children washed, dressed in matching outfits and ready to go! As soon as we had parked the car, all the little ones came flying at us, and it was cuddles all round. 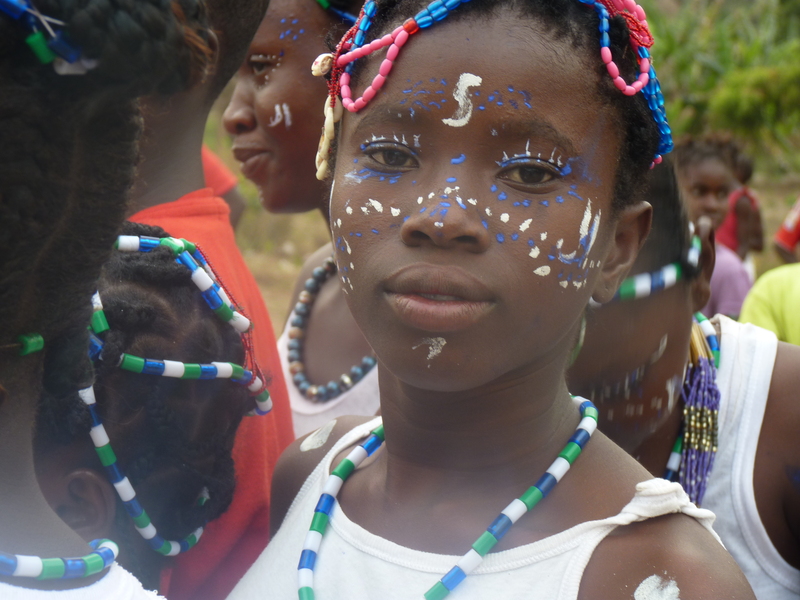 The older girls followed, so excited to show us their beaded hair and special costumes. It was great to see them so amped and excited for the show, it really made it clear why we are here doing what we’re doing. 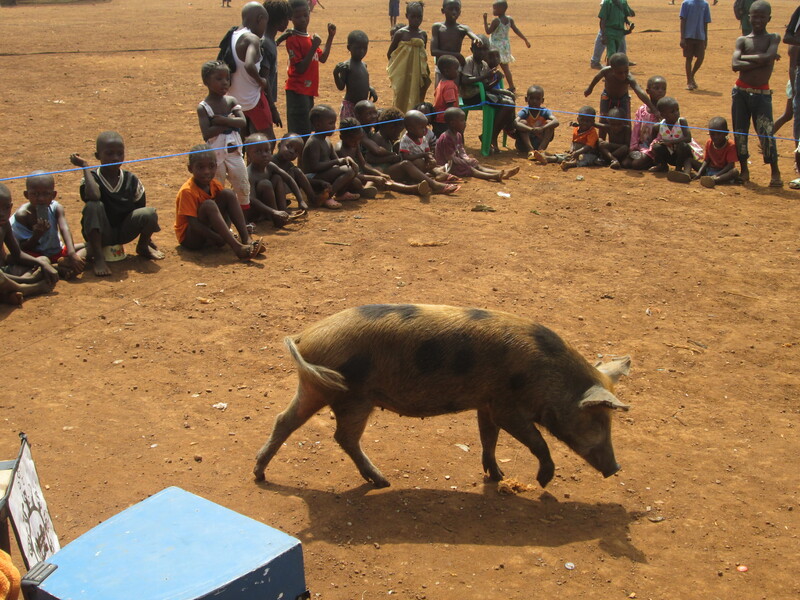 To be able to support a performance for kids like the ones in Kamakwei that have so little, was incredible. The excitement that came from knowing that the whole village had come to their home, to see THEM radiated off every single smiley face. The girls made so much effort with their costumes and face paint, they looked incredible! After starting with not much more than a big, dusty field, we soon had a stage with backdrop, a huge backstage area, seating, lights, music rigged up, flooring and 40 children in their costumes, faces and bodies painted – knowing exactly where, when and how to come on and off stage. 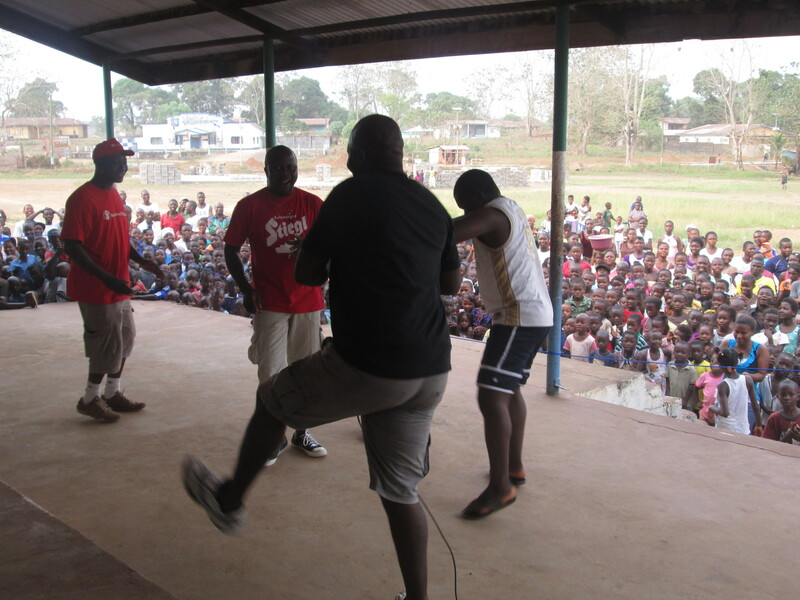 Then when the audience were seated (with the Paramount Chief right at the front), it was showtime! The boys were really excited to perform! 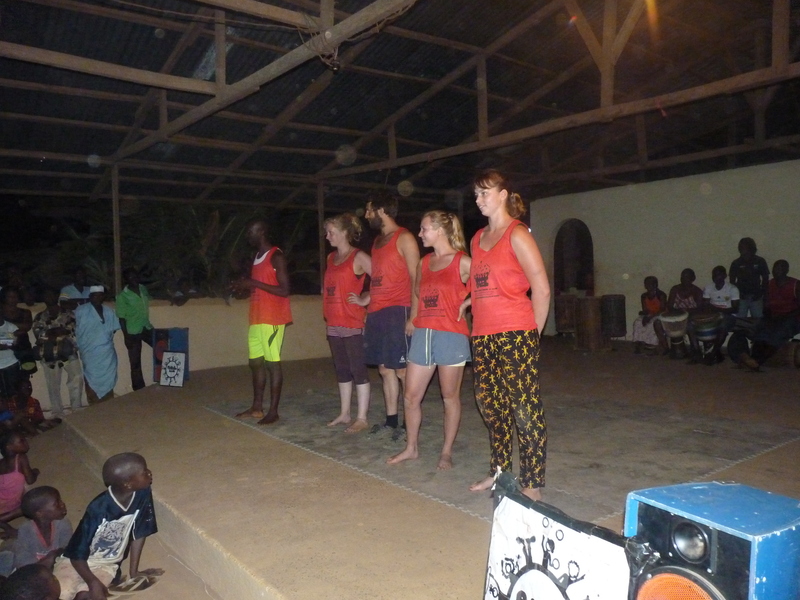 Opened by the youngest orphans singing a welcome song, the show got into full swing much to the amazement of the crowd who had clearly never seen anything like it before!! The children did so well and got a real buzz off performing. 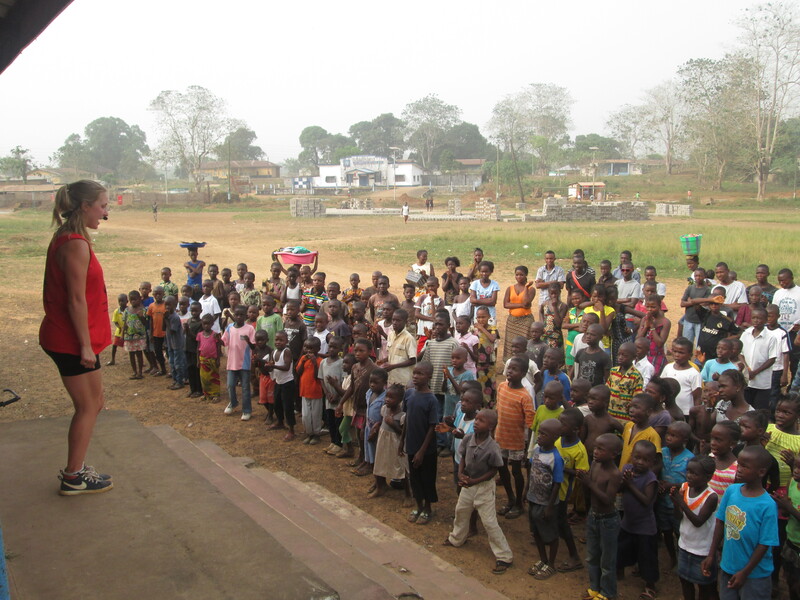 We did all of our regular acts and finished with a fire show, but it was so refreshing for the focus to be on the children and their achievements rather than on us. A great night was had by all and we were all ready for bed after a rewarding and challenging week in Kamakwei. Being laughed at for washing up wrong, Peachi being white & cooking and clothes washing too slowly. 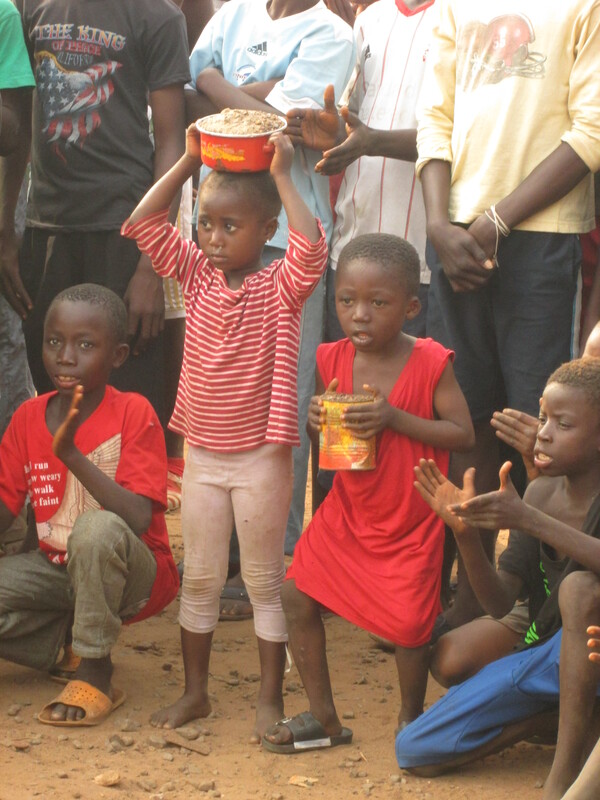 Having hoards of children help us get water from the well. The hat shop and cold drink shop in town. Pointing at invisible things in the distance to confuse children. The excitement from the children at an empty water bottle. The confused cockerel and baby chicks. Tim’s new hat and sandals. Someone keeps stealing my soap. This week we transitioned from the fairly inward work of producing and performing our fundraiser, to beginning our outreach work in schools. 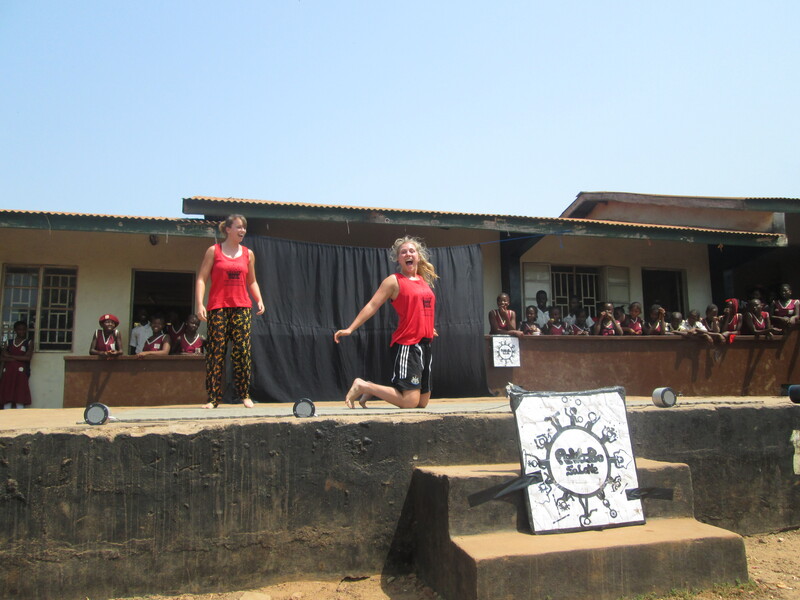 On Monday morning we pulled up to the SOS Lumley School in Freetown, still riding on a massive high from the success of our show on the Saturday. Considering we had been planning our tour for about 5 months, we were a little concerned to see that the Headmistress clearly had no idea who we were and why we were at her school. 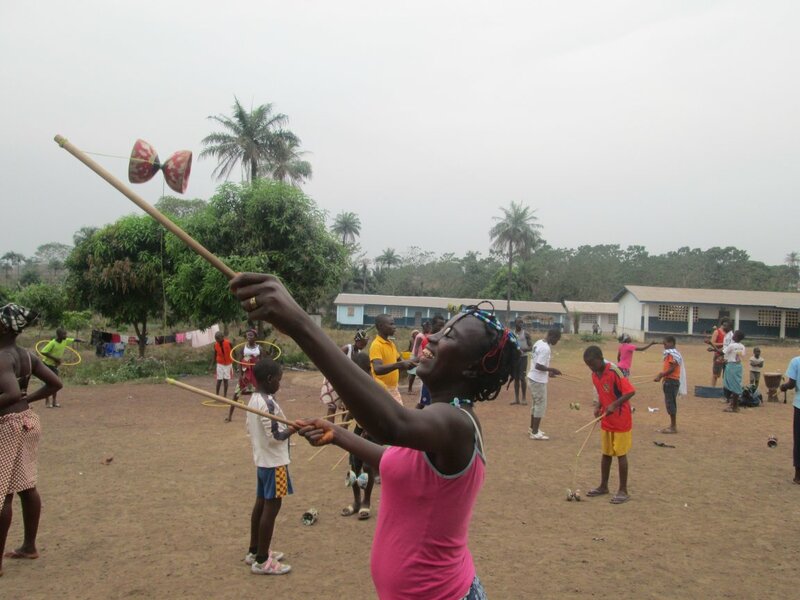 We’re starting to get used to the Sierra Leonean fondness of last minute planning, so shouldn’t have been too surprised when she took one look at our hoops, mats, juggling clubs and African drums, clapped her hands and summoned the Primary school for an impromptu assembly. 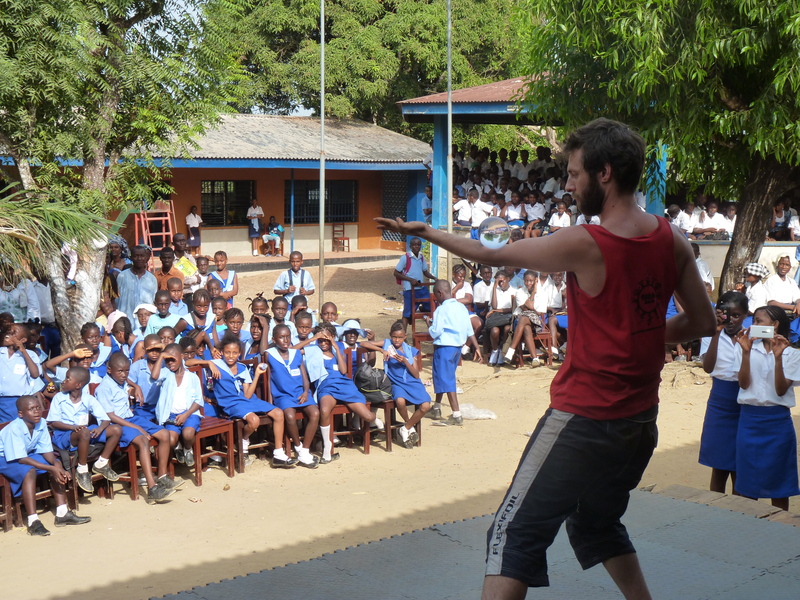 Performing for the primary and (in the afternoon) the secondary school gave us our first taste of what it would be like to show our skills to African school children. I’d like to say that it was our beloved, respective crafts that we have spent most of our lives working on that really amazed the kids. I’d like to say that. 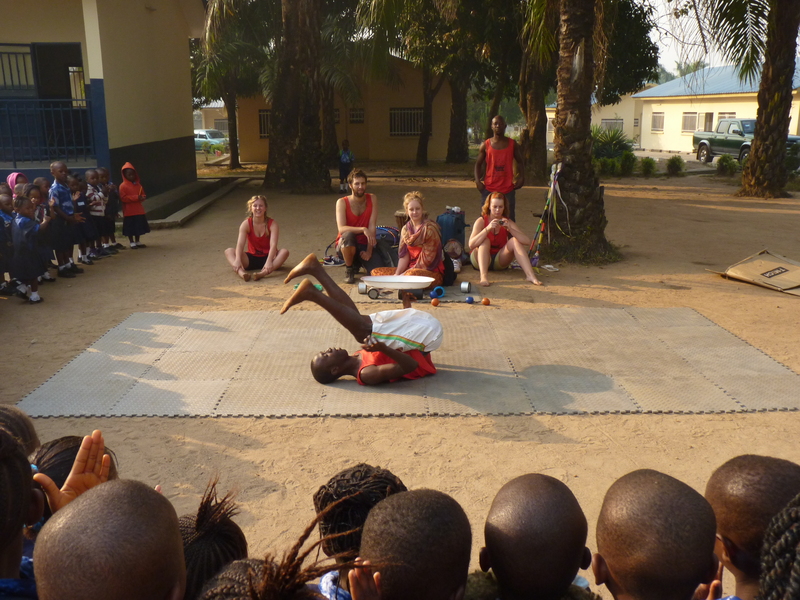 In reality, although we got a great response in general, the roof nearly blew off when we danced an African cultural dance we had learnt for the show with our other PeWiBo members. I’ve never heard an audience react so…excited? Shocked? Amused? Well…definitely loud. They thought we were hilarious. The younger groups that we teach are just so cute and really easily excited. I’ve got into the habit of punching the air and shouting “Yay!! !” every time we manage to do anything- whether that’s finishing a game or just making a circle. I do it, the kids follow. I love it because we just sort of celebrate every tiny little success and I definitely don’t so that enough in real life. I’ve also discovered ‘clap for yourself’ which is equally brilliant! It’s so nice to see these tiny balls of energy using every ounce of solemn concentration they have to catch a ball with one hand, or spin a diabolo and then exploding into 5 celebratory cartwheels afterwards in pure joy. 2.) Is it socks or paint? That made us laugh. A lot. 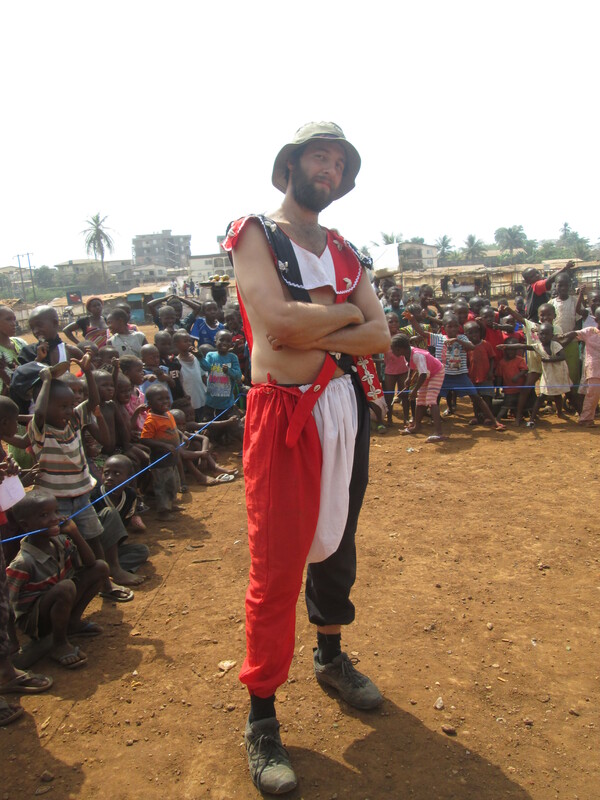 And gives you an idea of the degree of confusion that we strange, white, circus people have caused around Freetown! Though I’m on blog duty this week, I tore a muscle in my leg and couldn’t join the others on Wednesday and Thursday. 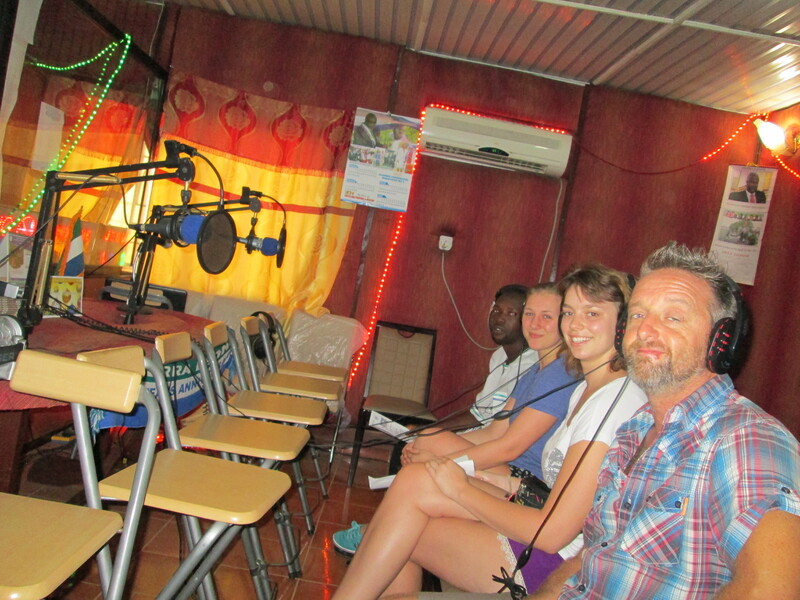 As I stayed in the Save The Children compound, getting on with blogs, flyers, videos and generally getting a touch of cabin fever, Tim, Livi and Katie cracked on with teaching. The teaching style here is very obedience centred. Teachers seem quite serious, are very quick to shout, and are not afraid to threaten with their canes. It’s quite a different culture and Livi even had to find a nice way of asking a teacher to stop telling her class off for laughing during their circus lesson. 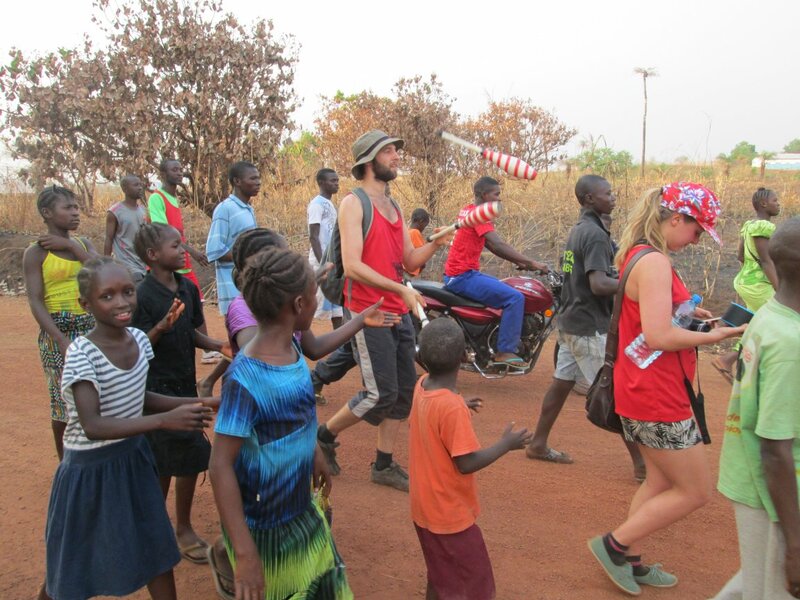 It might not be too much of a surprise then, that the big hit of the week was a version of musical statues where when the music (drumming) stops, we do everything in our power to make the kids giggle. I don’t think they have much exposure to adults being silly and just wanted to play again and again and again. 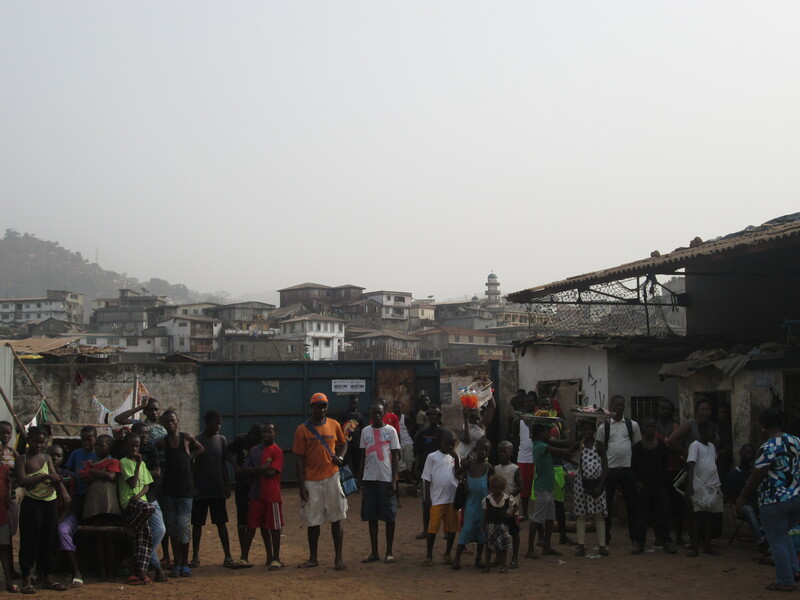 After enjoying a rare day off on Friday, on Saturday we headed to Don Bosco, an organisation in Freetown that works with street children. 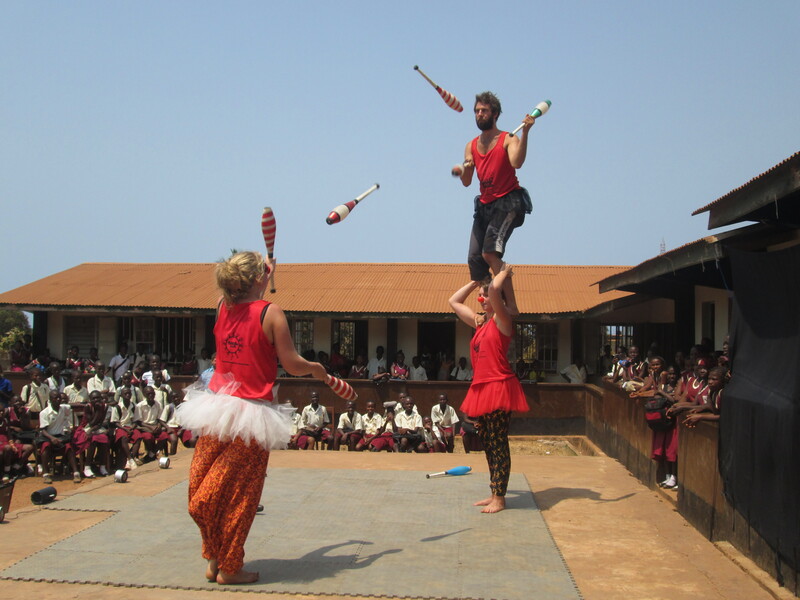 It is the organisation that took in Brima, our very own plate-spinning, hot footed, pasta (but not spaghetti) eating PeWiBo performer when he was young, and he still works with them today. There were hundreds of children there, some with adults, but most without. Watching and filming from the side (leg still wasn’t happy), I could see the children were completely transfixed though also slightly puzzled by seeing adults- white adults- acting so silly. On Sunday morning we bundled our bags, circus equipment, speakers, novelty blue afros, and all other necessary equipment into a pickup truck and set off on our 4 week road trip. 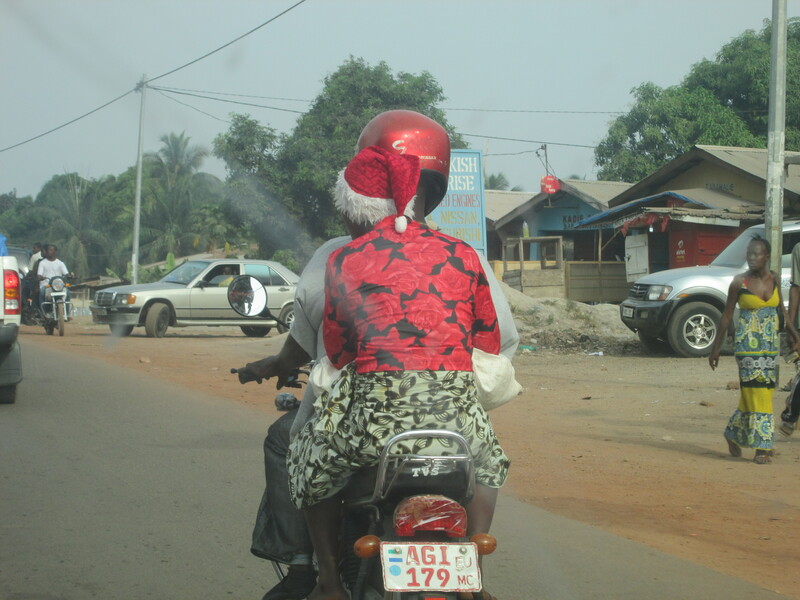 First stop; Makeni. 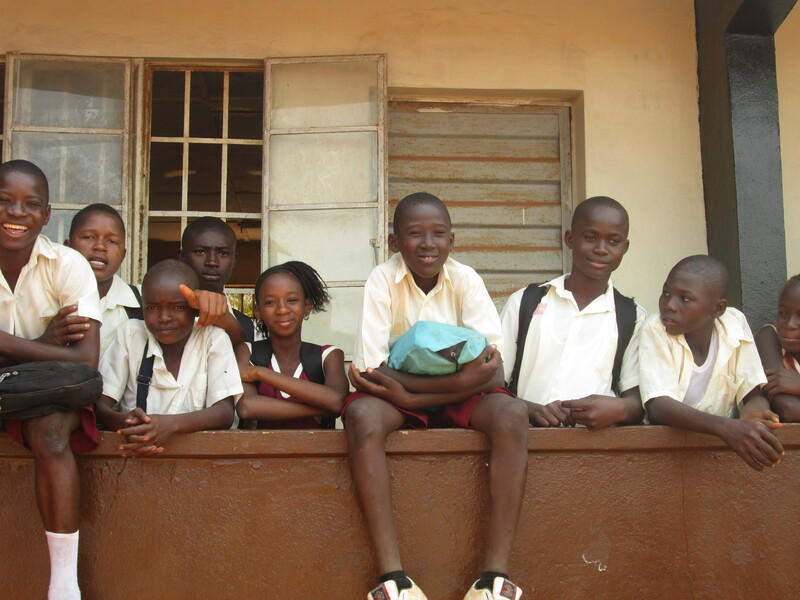 The SOS village in Makeni has 200 pupils, 115 of which live on-site in the orphanage. 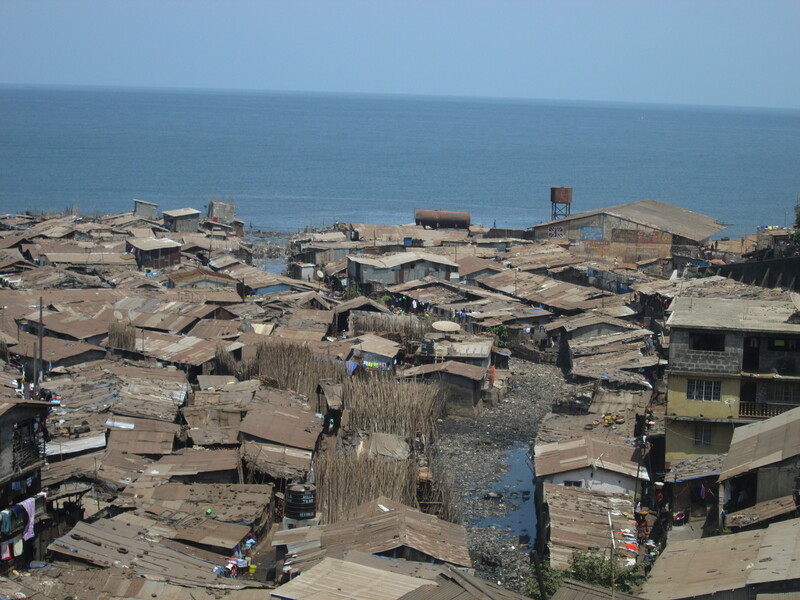 The orphanage is split into 11 houses and each house has its own mother and several assisting aunties. We are staying on site in their guest house and our welcome could not have been warmer. After a couple of hours of arriving and settling in, we heard children singing and clapping from outside and went to investigate. The entire orphanage were stood around a grass hut singing- faces screwed up, eyes shut, not even stopping when some strange, unknown white faces came to join them. I just had to let it all sink in. 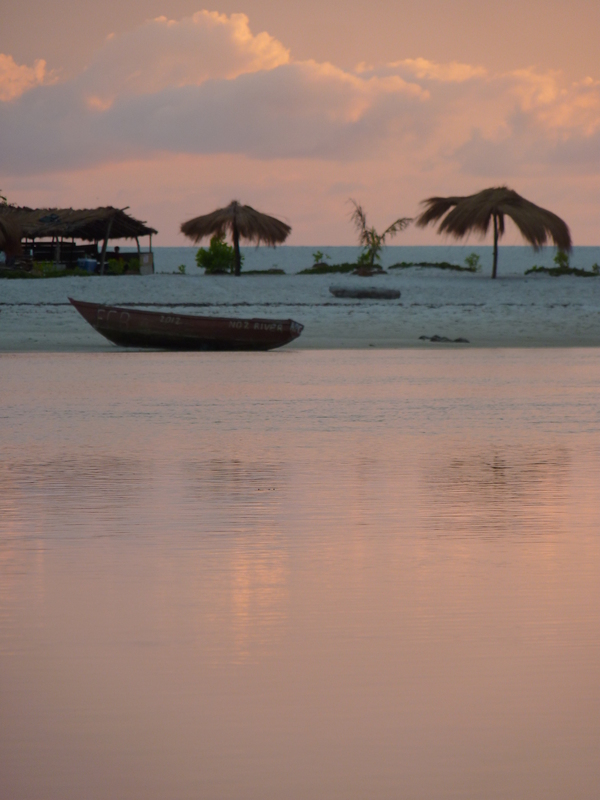 The weather was calming; the harshness of the midday heat was over and the sun was starting to set. The kids’ voices were harmonising so beautifully and were just so full of whatever it is that you lose as an adult. Afterwards the headmaster introduced us to the children and he spoke with a lot more care, love and charisma than any teacher I’ve seen here yet. Brima and his padiddle act (spinning trays) wowed the kindergartners! On Monday morning, we did two performances; one for Kindergarten and one for the school. 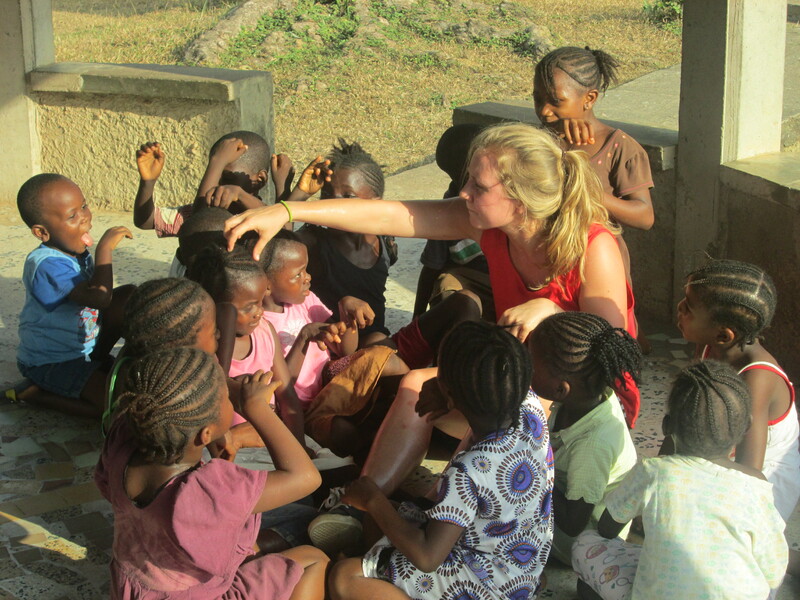 We then got into the rhythm of our new teaching timetable, starting with the 4 year-olds. 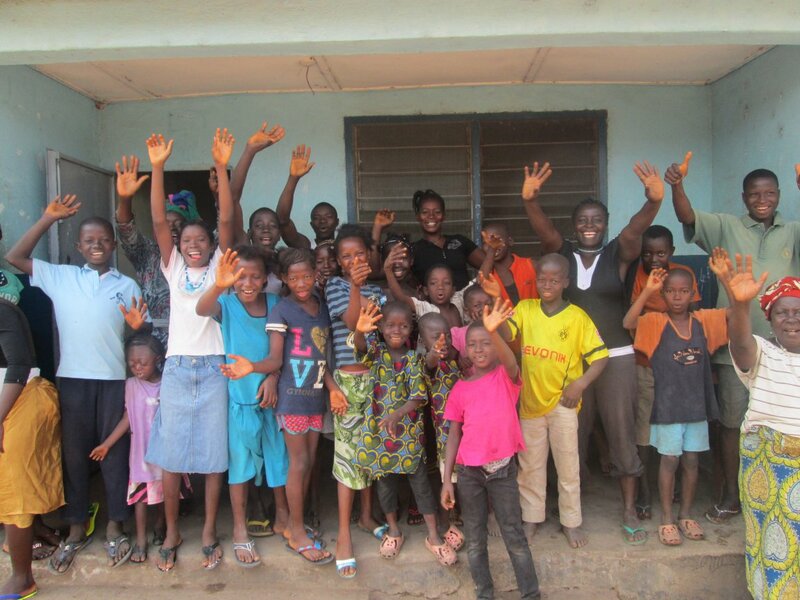 They toddled into our classroom with a little apprehension that we’ve gradually come to expect and left with massive smiles on their tiny faces. 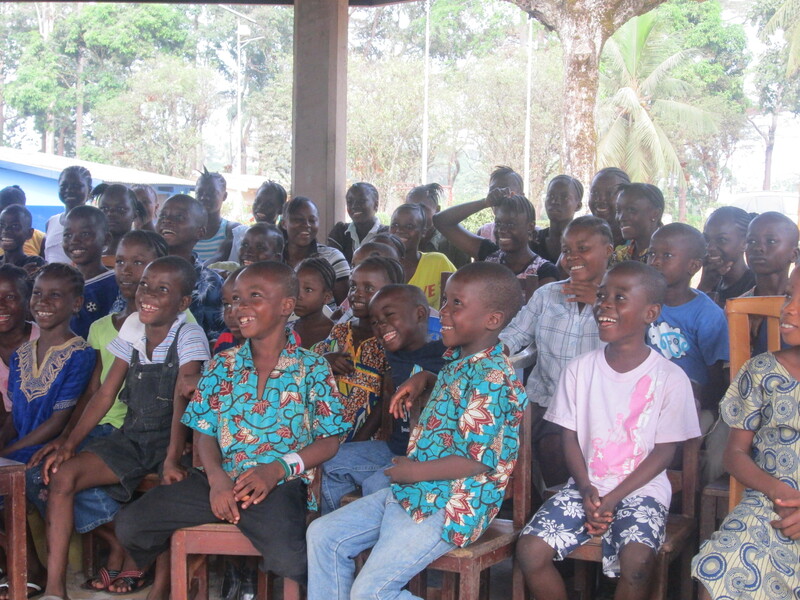 We’ve held morning classes for all the children in the school, so that every child has one lesson with us, but also have been able to prioritise those staying in the orphans’ village by teaching them separately in the afternoon. 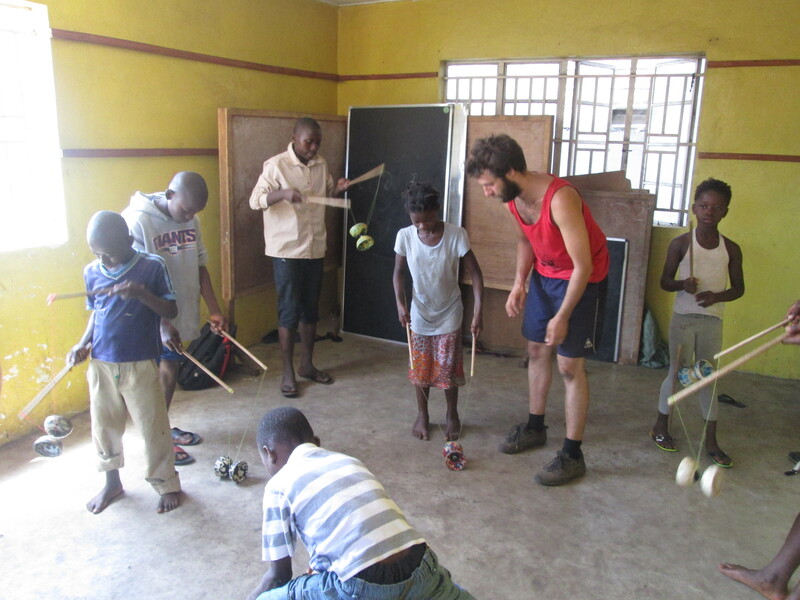 Teaching here is a fantastic whirlwind of African drums, street dance, Marco Polo (with optional dress-up afros), singing songs, cultural dancing, rubber chickens, and of course a very full circus kit bag unpacked and explored every lesson. It feels great to be living in the SOS village. We’re so connected to the project, and every face we meet is so excited to see us. The house mothers and aunties invite us in to their houses, ask us to hold their babies (we gave them back, I promise! ), give us cooking lessons and request that we ‘snap’ their picture again and again as they pose, hands on hips. I’m ambushed by excited little faces and shouts of “Aunty Emma!” wherever I go. We performed two fire shows this week. 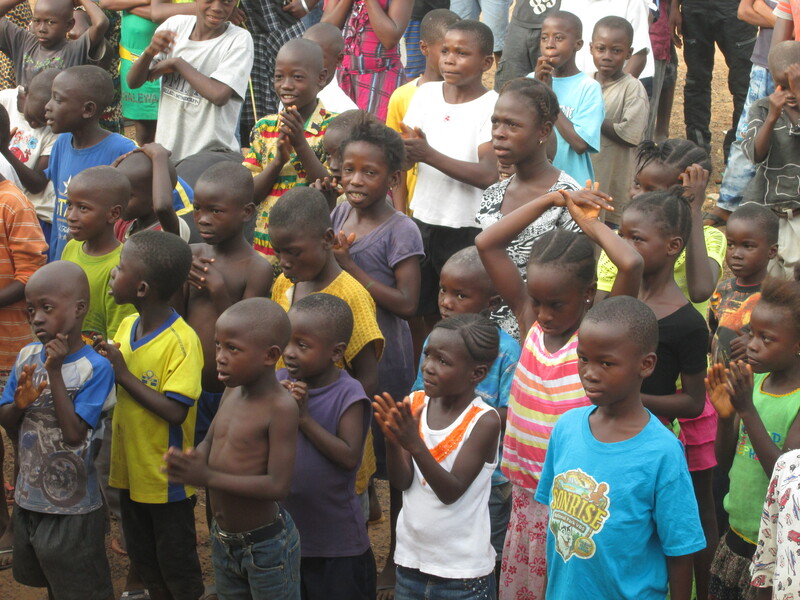 The first was for the orphanage who were patiently, but adamantly sat on their chairs about 2 hours before we were ready to start, out of sheer anticipation. 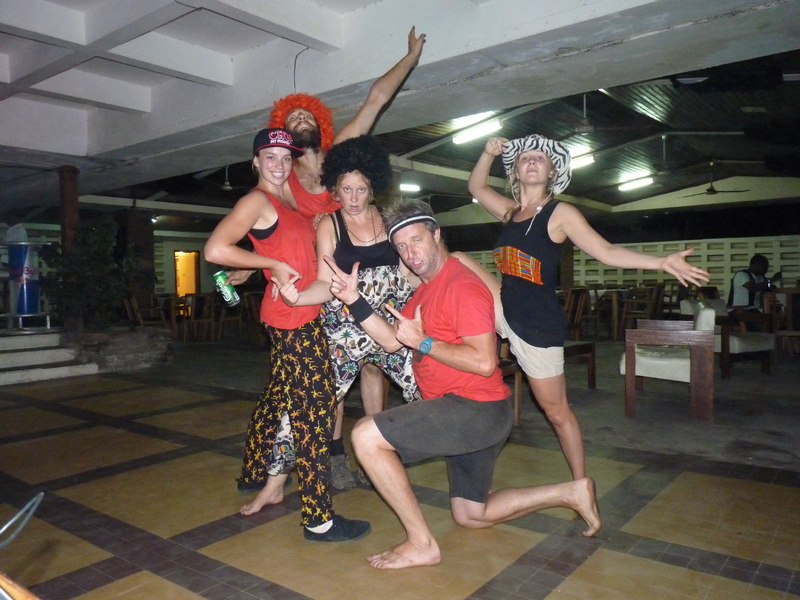 Safe to say that we met their expectations, especially when Tim and Morlai did their fantastic staff routine to the song of the moment, ‘Chop My Money’ (the Sierra Leonean equivalent of Gangnam Style). The second was a fundraiser that we did at a café operated by a charity called Street Child, who use the profits made through the café to take kids away from the streets and into schools and homes. We noticed half way through that we had a large (and growing) unofficial audience peering in from the street, over the top of the café’s wall, and I was so happy to see them enjoying it…seems we can’t avoid doing outreach work, even if it’s unintentional! Things I’ve learnt this week. 2.) You can’t get a whole orphanage to stand and wait patiently while you put them into groups and then expect only one group to follow you for a subsequent lesson. You will initiate an African child stampede. 7.) Learn to expect a plate full of carrots and a plate full of spaghetti for breakfast as the incredibly hospitable hosts bend over backwards to try and understand weird western eating habits…as well as the total surprise that spam isn’t suitable for a vegetarian. Similarly, if you say that a plate of cakes isn’t really enough for an evening meal, expect to get 3 plates of cakes the following evening. 10.) It’s a strange feeling to be performing a fire show in Africa, and then catch the end of the opening ceremony for the winter Olympics in Russia on TV. It’s incredible; 24 hours ago we were shaking, boogying and basically having an awesome time performing in the PWB/PeWiBo cultural fusion cabaret show! 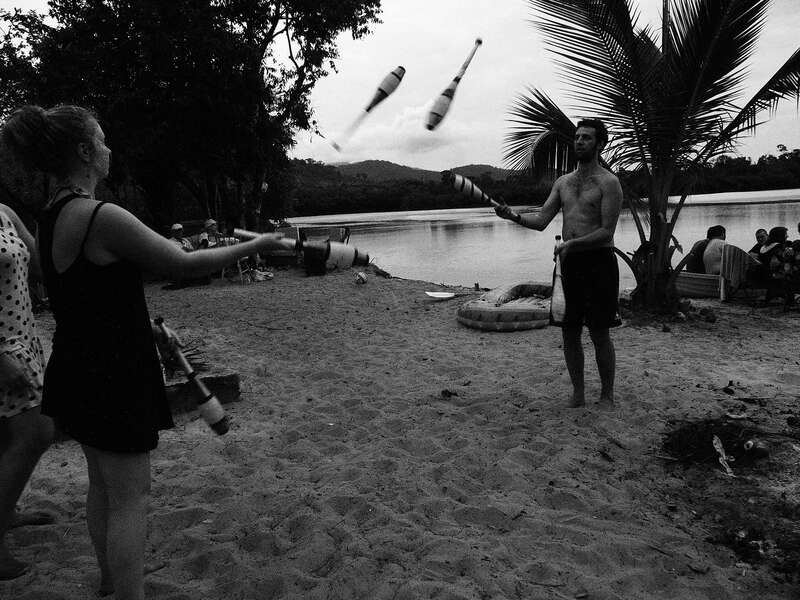 Even more amazing is that a week ago we were 8 performers on a beach with a bunch of toys and definitely no show. 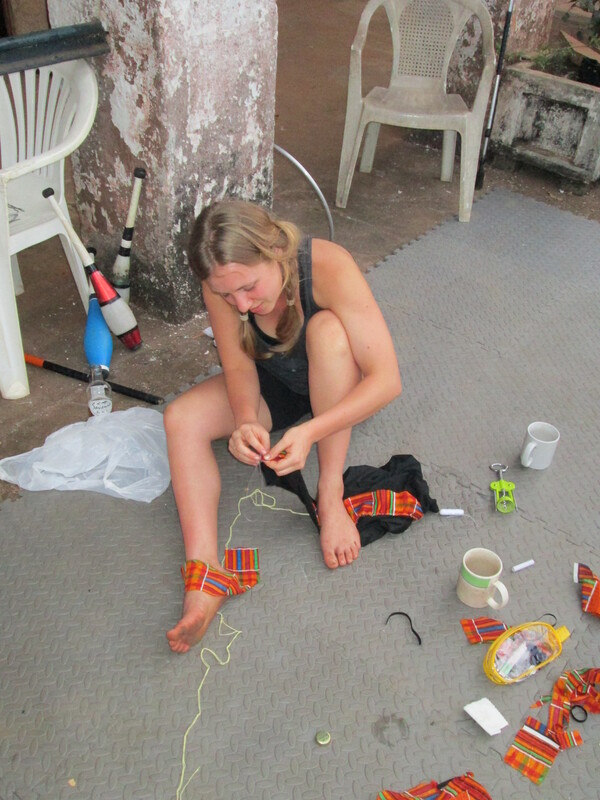 The journey we have all taken from then to now has been a roller coaster of sweaty training, sewing costumes, making fire toys and promoting the show. We turned our beautiful patio in the Save the Children complex into a training space with mats, cool beverages and lots and lots of circus toys. This happened after it became apparent the beach is no place to create a show…too much sand in the pants for successfully completing any sort of acro move! We spent the mornings training just us 4; Tim, Livi and I creating a trio comedy juggling piece, Emma working on her jazz and contemporary dances, plus lots of playing, stretching and the odd sit-up if the mood took us! In the afternoons we were joined by Brima, Morlai, Mummy and Tessay, 4 national performers from the cultural dance troupe. It was so special to spend this time together, not only could we swap ideas, training methods, routines and styles but it really helped us bond as a team and that training time seemed to become really important to everyone as the week went on. Because of that the quality of our work got higher and we all got a real buzz from training and working together. For me the real gem of the week was performing at the American School. We were invited by a friend and teacher there to perform a few tricks and hand out flyers in their assembly as a lead up to the show. The warm welcome and positive reaction of the children was incredible and gave us the boost we needed after training so hard all week that the show might in fact actually be a success! A thought I at least hadn’t allowed myself the luxury of thinking during the whirlwind of boot camp. It was hot and we were very sweaty (sorry, common theme occurring!) 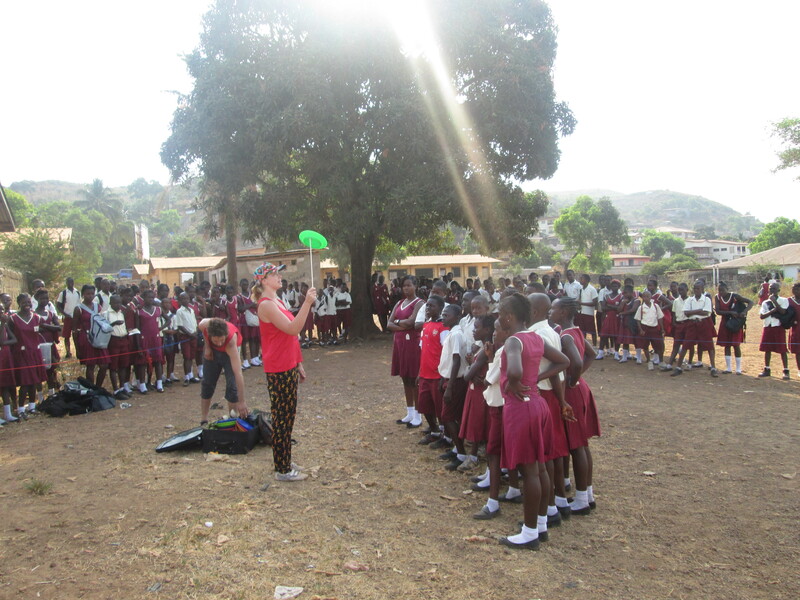 but the delighted children still swarmed us…questions to Tim about his INCREDIBLE contact ball, awe at Livi’s hoop skills and very funky stripy jacket and a particularly cute boy too shy to look us in the eye so instead very timidly reading questions from his schoolbook…ADORABLE! The best for me though was in regards to mine and Emma’s ‘Puppet dance’ in which I manipulate her like she’s on strings. Firstly the children find it hilarious that she can’t stand up right then a tiny blonde girl toddled up to us and very seriously asked if there were real strings on Emma. Of course she said yes and proceeded to be dragged around the playground by her ‘strings’ and as the little girls new favourite toy 🙂 I love children’s endless imagination and was so glad we had managed to tap into at least one child’s sense of play. The space at the British Council was great, a big plywood stage (with only 2 or 3 holes in it to gaffer over!) a huge auditorium to seat 150 people, lots of room backstage and a handy yard round the back to pre-dip the fire toys. The shows were incredibly fun! It was AWESOME to see how the national guys come alive the minute they hit that stage. A lot of lessons were taught in that matinee performance…them to us about style, performance and how it should be done and us to them about backstage etiquette, not just randomly walking through the back curtain and never spraying aerosol next to the lit fire toys! A real treat was when all 8 of us performed a jazz routine Emma had choreographed. Now I’m no stranger to jazz but this was not an easy routine. Very fast and a million miles away in style from African dance, everyone trained and trained and trained until it was perfect and boy was it worth it on the night! I am in awe of the National’s energy, style, commitment and passion; at one point I was sat backstage and couldn’t help smiling to myself about the absurdity of the situation…Africa, cultural dance and costumes, very loud drumming, big cabaret show, MASSIVE fire finale, all in 31°C heat. Yeah no problem!! 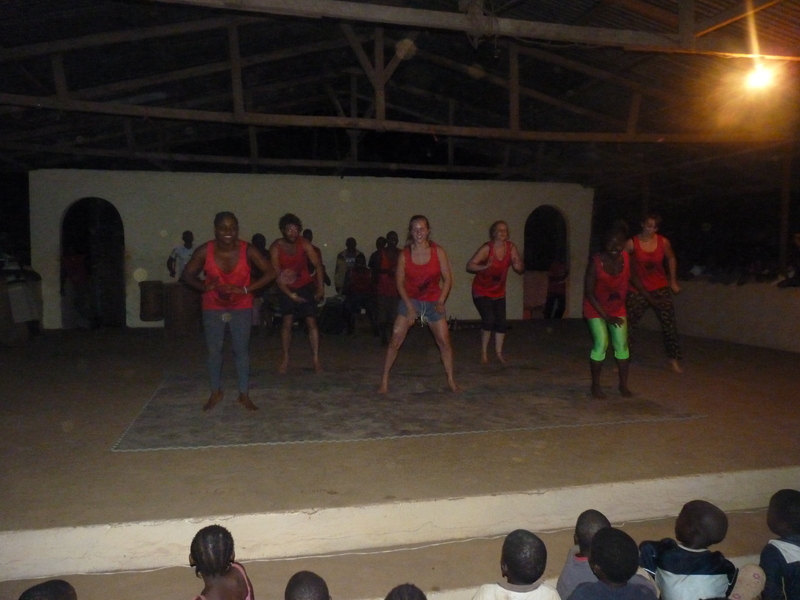 After a hearty supper of rice and beans the evening performance went like a dream. We had lots of positive feedback and even big guys like the head of UNICEF were watching! 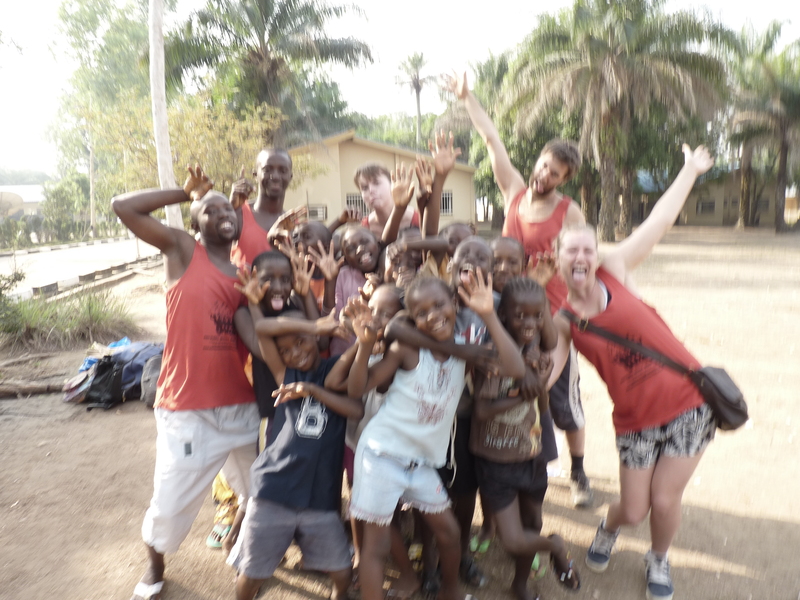 In total we raised over £1000 but it sounds much more impressive to say 6,000,000 leones J We are now in a great financial position to head out on our tour, but more than that we have bonded as a team and feel ready to get out there and spread some PeWiBo PWB African Circus loving to the children of Sierra Leone! 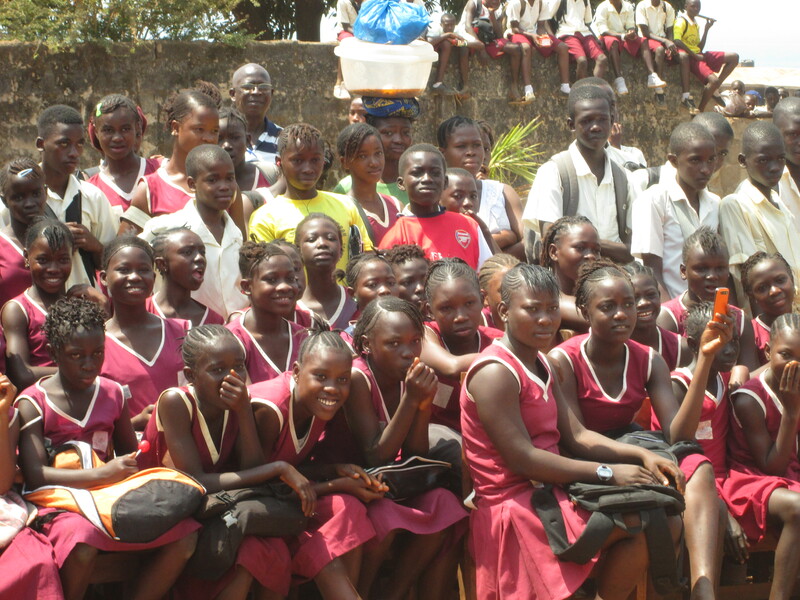 Sierra Leone Team Blog 1! So, The Performers Without Borders (PeWiBo) team arrived at Heathrow on a cold, rainy and grey January morning- half asleep and probably a little apprehensive about our tour to a country none of us had ever travelled to- labelled by the media as having a colourful and complicated recent past. I, Livi (or Grandma), provide the team with the basic essentials of a PWB tour- Drumstick lollies and squeakers. We then met Uncle Harold the pilot- Emma’s magical uncle who wiggled us 3 free air tickets to and from Sierra Leone- Thank you BA. Not only did that help us keep our volunteer contributions low, but we also got upgraded to world traveller plus- allowing us to squeak our way in excitement and comfort to Africa. I’m sure we were very popular with the other passengers on the flight! We even got to preach our message to the co-pilot who came for a little chat about the wonderful work that PWB do. 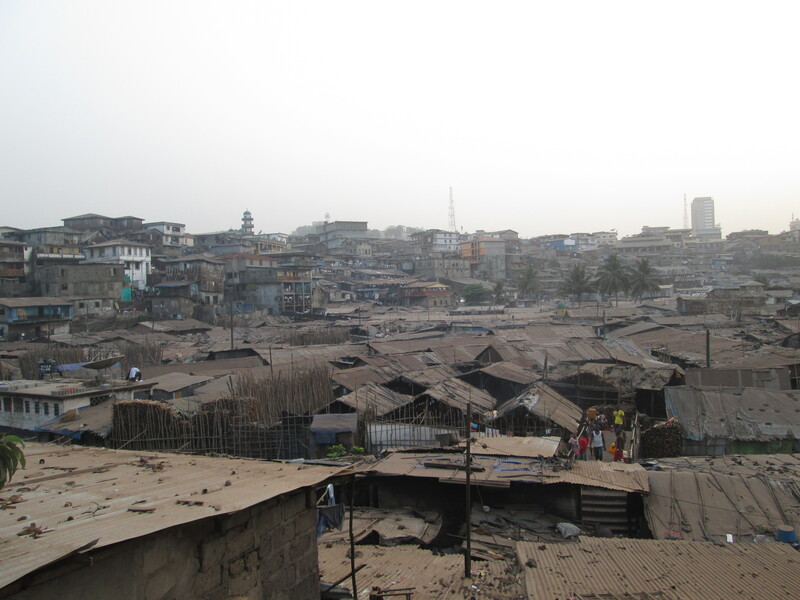 Our arrival in Africa soon brought us back down to earth, when only half of our bags made it with us to Sierra Leone! Luckily all the hoops arrived, and all my bags. So for our first day everyone dressed as Livi, except for Tim…I think the girls were happy my bags arrived and not his. After waiting for 1.5 hours at the airport in a ‘queue’ of angry Africans, we were introduced to the concept of ‘Africa Time’ very abruptly and realised that our punctuality had to be replaced by smiles and patience- and of course, we were the last to leave the airport. Once the bags were sorted by the friendly airport staff Baibai, our Save the Children representative, helped us find our way out of Lungi International Airport to a small coach and made our way to the river estury to get to Freetown. It was such a relief to have my toes in the sand once again, and being surrounded by palm trees made me feel surprisingly like I was at home! We were stuffed onto a small boat, tied to a small jetty in very choppy waters- two of our team felt extremely sea sick and were glad to be on the move. Once at the other end we were met by a smiling Peachy and car to drive the bumpy road up to our home from home the save the children compound. We were welcomed by Clare and the three puppies living here. After some rare and amazing veggie chili- Veggie dishes being usually out of the African cuisine- and acclimatising to the heat (great after leaving England mid-winter) we settled down for our first African sleep. Our first day involved a preliminary meeting discussing the details of the tour and what acts we would contribute to our fundraiser on the 25th January. 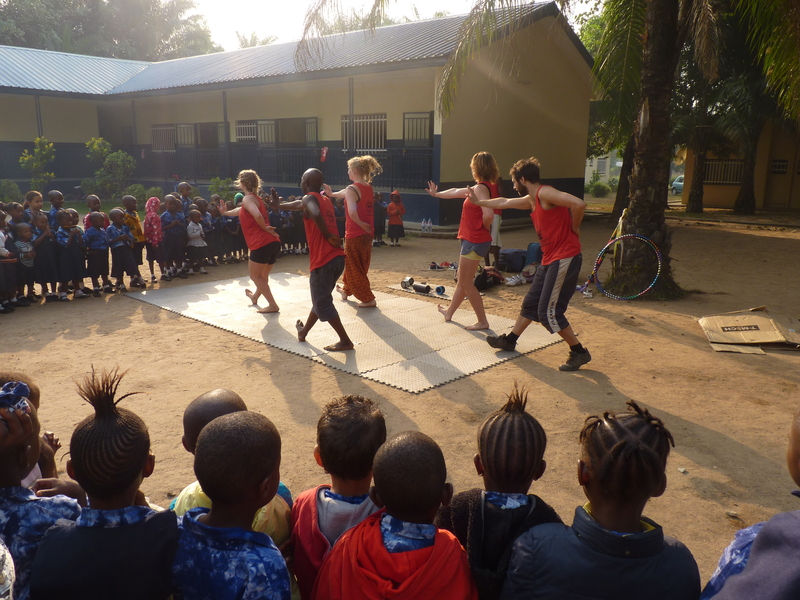 For the first time in PWB history, we also had to take into account our local PeWiBo performers, who would be joining us on tour and we were all very excited to meet them! We the other half of the team at Cue bar, a bar/gym combo on the beach where the touch rugby team meets every week. After an awkward minute or two we were comparing both the differences and similarities in performing lifestyles from either country- Can be amazing what a passion for performance gives you in common! 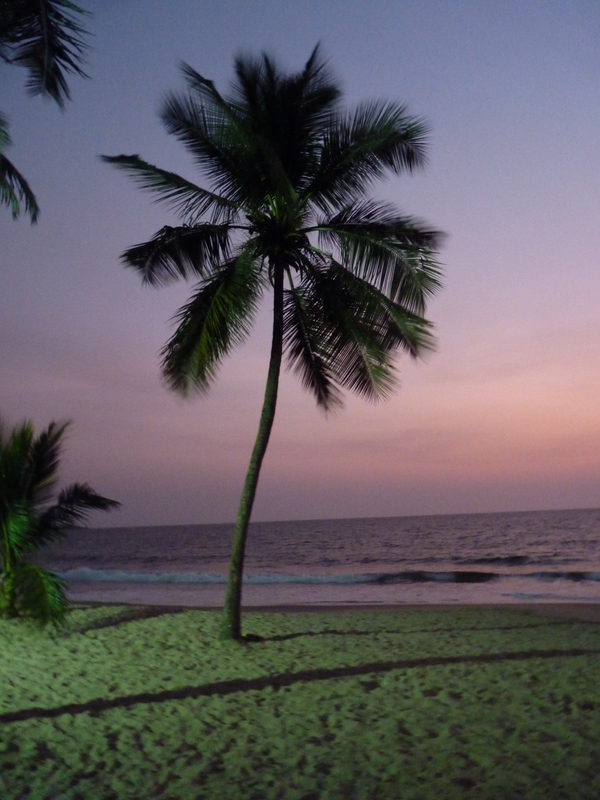 Our first weekend before Bootcamp involved a welcome party at Cockle Point- a beautiful, secluded beach with a fantastic view, quite different from the hustle and bustle in the city of Freetown. We enjoyed a day of swimming in the sea before settling down to a group meal with a selection of local friends, other ex-pats working for charity, travellers and locals. 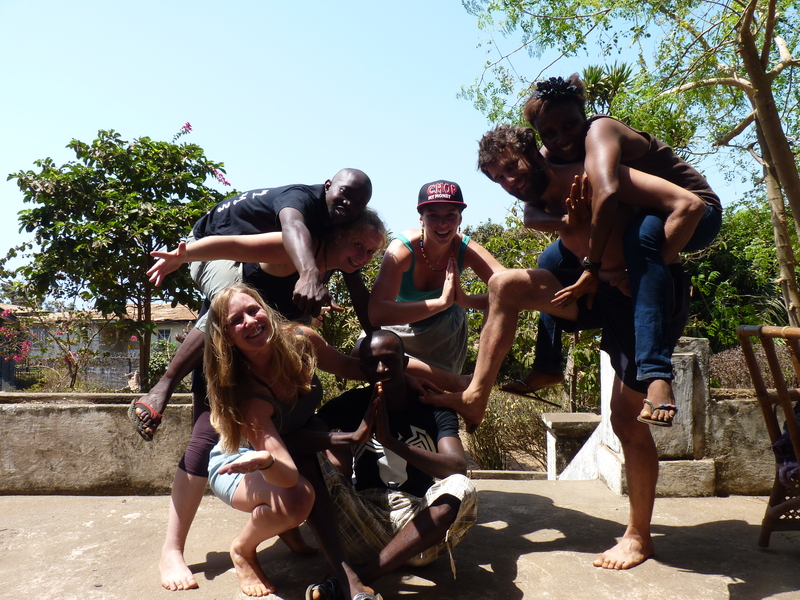 Peachy set up a DJ booth with fairy lights and his new speakers (RA-style) and we performed our first show together as a team- some enjoyed their first fire performance on a beach in Sierra Leone- something to remember! It was great to show everyone and each other our skills and the team bonded with sharing dance styles and the Sierra leone dance anthems like ‘chop my money’. Everyone slowly crept to bed, leaving the last few to enjoy some late night reggae under the full moon-yes mate- thank god for the mini-rigs J. The morning was met with a welcomed cool swim to sooth the inevitable doxycycline burn from the day before followed by a lazy day of amusing card games and relaxing by the sea. By the time we arrived home we were all relaxed and acclimatised to the heat and ready for a 8.30 start for Bootcamp the next day. 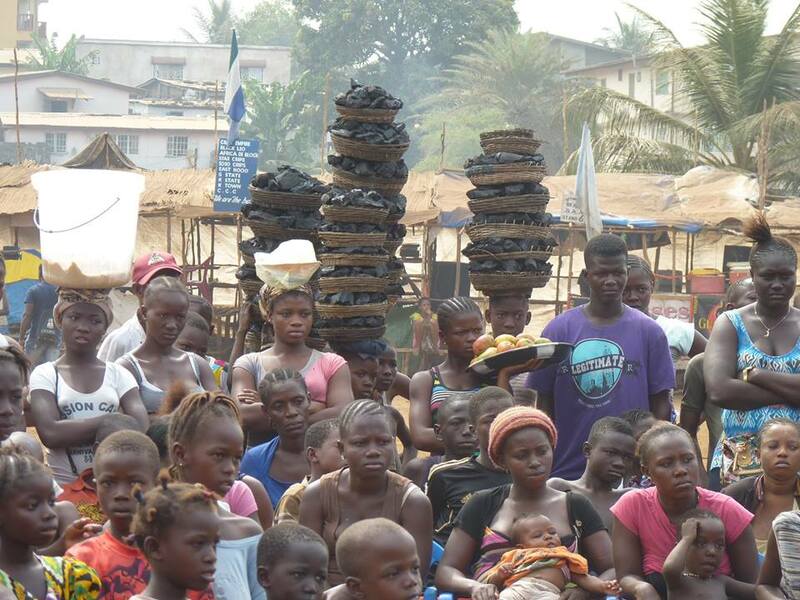 You are currently browsing the archives for the Sierra Leone 2014 category.